The theme for #TeacherTuesday this week of technology and access to learning is dear to my heart and my work from the past 20 years. Also, having lived in Bangladesh for four years, 2003-2007, I have great empathy with the teacher this week as I have seen and interacted with and lived with the wonderful people of Bangladesh who have a resilience, an amazing intellect and joy for life. The teacher interviewed is Mosammat Reba Khatun. She is 40 years old and lives in a small riverside village in Bangladesh. She completed 10 years of schooling, is a single mother and lives with her parents. Much of the text below is in Mosammat's own words, (indicated by a different font). I teach on Shidhulai Swanirvar Sangstha’s solar-powered floating school and I have been teaching there for the last 10 years. The school is located on the Gumani river in the Pabna district in northwest Bangladesh. Our floating school works in the remote river basin where there is no education option, particularly during the monsoon season. It collects children from their homes, teaches them on board and returns them at the end of the session. Then the school-boat moves onto the next village. The school offers three shifts per day and reaches a total of 90 students. It runs from January to December. Our school has a classroom for 30 students and internet-linked computers and electronic resources. Our floating school provides education up to grade IV. Students are 6 to 9 years old. The students that get good exam results receive the SuryaHurricane solar lantern (a low-cost solar lantern made from recycled parts of the conventional and much-used kerosene lantern) as scholarships. Parents also receive on-board trainings on human rights, nutrition, health & hygiene, sustainable farming, and climate change adaptations. I teach students in grade II. My students are 7-8 years old and they study Bengali, Maths, English, and learn drawing and there are 30 students in our class. 67 percent of the student are female. We need the floating school because in the monsoon season (late June to October), one third of Bangladesh goes underwater. Boats are the only means of communication in the flood-prone areas. It makes it very difficult to access basic services. Roads to schools get flooded and children cannot go to land-based schools. Therefore the floating school is the only education option here - it travels to students and provide education at the doorsteps. The school-boat is specially designed by architect Mohammed Rezwan (founder of Shidhulai Swanirvar Sangstha) to adjust to any equipment configuration as well as to protect the electronic equipment from heavy monsoon. The boat is outfitted with a multi-layered waterproof roof. It is built with local materials, traditional knowledge and labour. Shidhulai Swanirvar Sangstha was a 2012 WISE Award winner (World Innovation Summit in Education, Qatar). I was there at WISE that year when Mohammed Rezwan accepted this award. You can find many more details, including videos, about the solar-powered floating schools on the WISE website. There is also an interesting live chat archive and an interview transcript with Mr Rezwan. 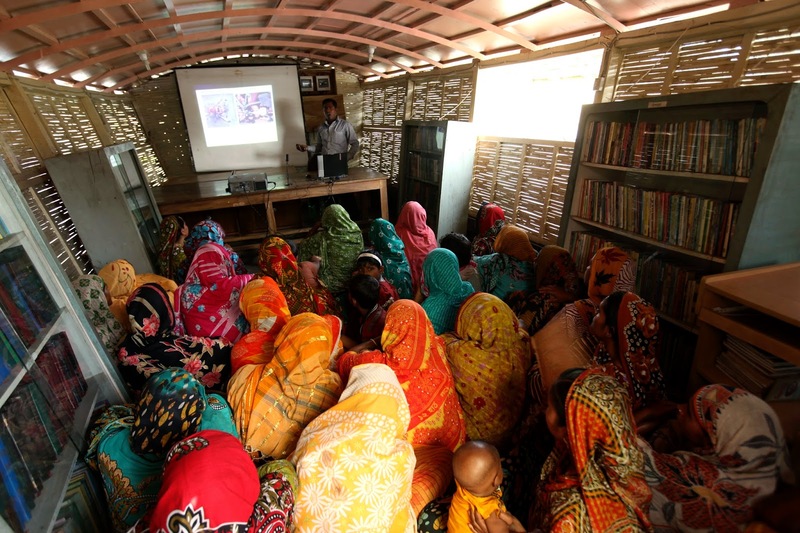 The floating school ensures access to education and information in the monsoon season. It encourages parents to send their girls to schools and pushes for female enrolment. The trained parents grow new crops that ensure foods and year-round income. The rate of early marriage is reduced. This floating school is the combination of a school bus and schoolhouse. I am teaching our students at our doorsteps. It saves time for the working children and me. 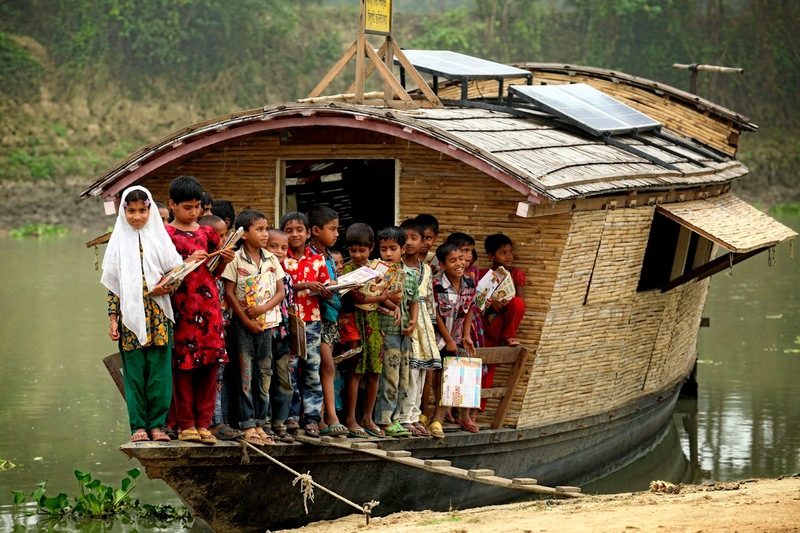 There is an overwhelming need for floating schools in the flood-prone communities. About 20 percent of each village population is school age therefore many parents want their children to get enrolled in the floating school. They always request for the enrolment of their children. A lot has changed in the last 10 years. To begin with there were not any computers or solar powered system on the boat. Considering the need, Shidhulai Swanirvar Sangstha gradually introduced the computer and internet, then the solar system. When we found the surplus solar energy on the boat, the organization introduced the solar lantern. The design of the boat was changed during the past years. Technology is very important to us as we use Internet linked computers at school. We use cellular data network for Internet connectivity. Children learn computer skills and watch educational shows. It encourages children and helps to learn more. Computers in the classroom have encouraged the students to learn the new technology, watch the educational shows, learn how to draw pictures and visit the online educational websites. I think technology makes learning easier for children from disadvantaged backgrounds. For example because the students often live in such remote areas that are often off the [power] grid we have started the lantern scheme to enable children to do their homework in the evenings. Only 5 students in each class have received a SuryaHurricane solar lantern as scholarships so far, but most of the houses want the SuryaHurricane solar lantern. There is a real growing demand of renewable energy and communication technology in Bangladesh. "Innovation in the use of technology can help improve learning by enriching teachers’ curriculum delivery and encouraging flexibility in pupil learning. Greater access to computers in schools helps reduce the digital divide between low and high income groups. However, new technology is not a substitute for good teaching." "In poorer countries, the availability of ICT infrastructure remains a crucial consideration. Many countries cannot yet support widespread computer-assisted learning because schools lack internet access or, in some cases, even electricity supply. But, given the investment required by poorer countries to ensure that all schools have electricity supply or internet access, the use of ICT is unlikely to be as cost-effective as spending more on teachers to reduce class sizes. Teachers remain central to curriculum delivery, particularly for low achievers needing additional support." It seems to me the floating solar-powered boat model brings technology to the classroom by providing essential infrastructure at a workable cost. The next step is to focus on the design of interactive software and how that supports learning within and beyond the indigenous culture. The teaching can be very challenging, as we are working with children from landless, extremely poor families vulnerable to natural disasters. Their parents mostly work as day laborers and have irregular family income. The condition of the houses is poor. The children under age 5 are malnourished and infant mortality rate is high. Girls are not allowed to move around freely. Many parents are reluctant to let girls go to school but we meet with the parents monthly to encourage them to send their children to school regularly so as to ensure good attendance and low drop out numbers. Our school curriculum is student focused, interactive, interesting and designed to be fun for children. Our class size is limited to 30 students which allows for teacher and student bonding. Our students are involved in reciting rhyme and poem, singing, story-telling, reading and discussion on books from the library, drawing pictures on paper, writing poems, etc. These are the ways the children are encouraged to express their creativity and learn more. Students are also encouraged to participate and work in groups. Generally the children find it easy learning how to read and write at our school. guidelines. Also, there are day-long refresher training sessions every month. They cover next month’s syllabus and teaching guidelines, parents meeting agenda and extracurricular activities. 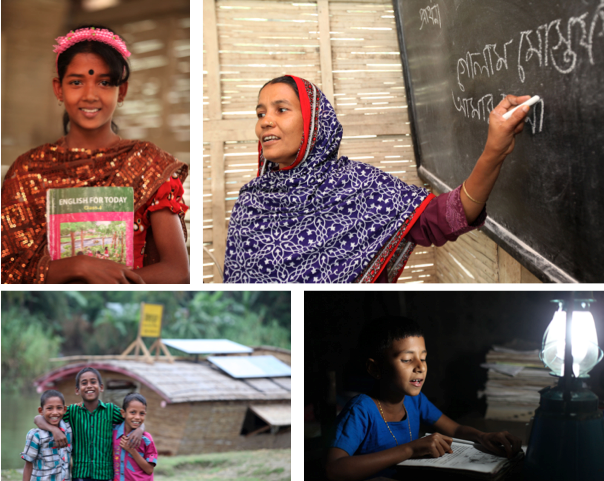 At the monthly training, we discuss also about the school performance during the previous month, challenges, and required educational materials (we receive primary textbooks - grade 2 to 4 - from Upazila Education Offices of the Bangladesh Government). We also share feedback received from the parents. I start the day very early in the morning. I cook food for my daughter and me. Then I teach on the floating school. I work 4 hours each day for teaching and lesson planning/marking. My classes finish at lunchtime. After returning home, I work as a tailor. In the evening, I travel through our village to meet the students and their families. The school can help the whole family - Muhammad Sagar Hossain (7 years) is a student of grade II on the floating school. His father Muhammad Altaf Hossain is a day labourer, who seasonally migrates to town in search for work. His mother Ms. Munira Begum looks after the family and works in their homestead garden. She received agriculture training on Shidhulai’s floating training centre, and now practices sustainable farming. Sagar’s older sister Mosammat Munni Khatun also studied on the floating school. He wants to be a floating schoolteacher to teach his villagers. I hope for the future the importance of creating access to schools for thousands of children living in the flood-prone areas of the country is recognised. In the flood-prone regions the roads to school get flooded and some schools go under floodwater and children therefore cannot go to school in the monsoon season. It is the main reason for school drop outs in rural Bangladesh. I think the government, its development partners, Shidhulai Swanirvar Sangstha and other NGOs should work together to bring more floating schools across the country. I decided to become a teacher because I love children and wanted to help them towards developing a better future. I believe our teaching inspires them, it always remains in their heart and becomes a part of their life. I think teaching is a gift of a lifetime. It has given me immense opportunity to give back to my community, help poor students to access to school, and impart positively on children. What an amazing idea! Great to see these marginalized kids getting the educational attention they deserve. I want to help this school in the future through my non-profit.